Hmm...I'm not sure my social life would survive it. Its unsteady as it is. 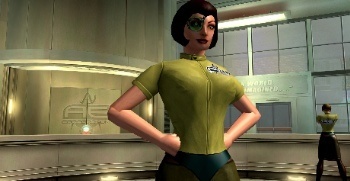 That was my main complaint with CoH is that it didn't have enough mission variety. It was always "Go into this warehouse. Kill everything. Leave. DO IT AGAIN." Where were the high-speed car chases, mind-controlling parasites, and ticking time bombs set to level the city? I managed to slap together a fun mission about the fabled Sony Defense Force raiding the NPD facility in order to sabotage next months sales results. Within about 15 minutes I had a fully functioning mission, complete with a boss that cried out "Wait for Uncharted 2!" upon being defeated. It may be time to re-subscribe! Much as I think this idea is a nice one...User created missions? Can you see what sort of horrors people will unleash? Especially with Ghost Widow et. al. "Ooh, those arms are usable for something else, Lord Arachnos..."